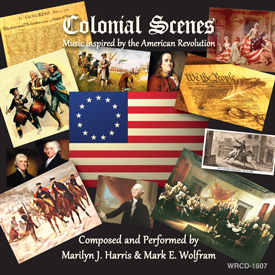 Subtitled "Music inspired by the American Revolution", composers Marilyn Harris and Mark Wolfram have distilled the musical essence from this pivotal time in the birth of the United States of America into a satisfying musical collection. Influences of marching, piping (both American & British), dancing in the salon, communicating sorrow, loss, nervous anticipation and remembrance, these musical selections bring you back to a time when saluting the Stars & Stripes meant freedom and independence...but it could also mean treason - and death! Please print out this form and send it with your check or money order (U.S. Funds only, please!) payable to: HARRIS/WOLFRAM PRODUCTIONS, INC. - 13942 E. Via del Abrigo, Vail, AZ • 85641-2052 • U.S.A.